France will invite architects from across the globe to submit designs for a new spire for Notre-Dame Cathedral, it was announced Wednesday. 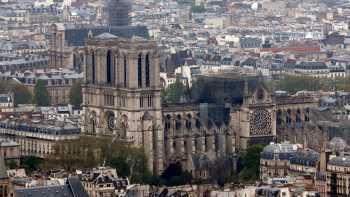 The original 300-foot spire collapsed during the fire that devastated the world famous cathedral on Monday evening. The fire raged for nearly 15 hours. “The international competition will allow us to ask the question of whether we should recreate the spire as it was conceived by [Eugene] Viollet-le-Duc or if, as is often the case in the evolution of heritage, we should endow Notre-Dame with a new spire,” said Philippe. Authorities currently have no estimation of the total cost of the damage and renovation work required. President Macron has vowed to rebuild Notre-Dame Cathedral within five years saying it would be “even more beautiful.” However, some experts have suggested the work might take decades. The cause of the fire is currently being investigated with workers from companies involved in renovations that were underway being questioned. Cardi B Is Perfecting Her Runway Walk With the Help of "Baby Shark"